Pallavi comes to Amritsar’s police station and says to the inspector that she has lost her purse. The inspector files a case and Pallavi sees Yuvi in the jail. Pallavi asks the inspector is he a businesswoman’s son? The inspector says yes and asks the constables to do Yuvi’s transfer process. Twinkle asks the inspector to find the real culprit asap. Twinkle calls Bunty and says she will not be doing the wedding and asks to look for a new planner. Pallavi smiles Yuvi as Inspector says he will be forever in the jail now.Twinkle recalls how she used to fight while making wedding preparations. Kunj asks the nurse about the doctor and nurse says that doctor is out. Babbe says to Twinkle that she has done the Medendi arrangements and Usha says she has done the caterers work and Leela says she too will help. Babbe asks Twinkle to make tea for all. Twinkle thinks what will happen as she has already told the Bunty to look for a new planner. Door bell rings and Twinkle sees Pallavi and Pallavi asks is she Twinkle Sarna. Twinkle says yes and Pallavi requests she wants to get some experience from wedding preparations. Twinkle asks for resume and Pallavi gives an says she has done event management and Twinkle says fine. Twinkle’s cloth gets stuck in Pallavi’s watch and she removes it giving a smile. Twinkle thinks to solve Yuvi’s case asap and goes to the room and calls Chinki and asks did Yuvi call her? Chinki says yes and Twinkle asks what did he say? Chinki says but is shown muted for us. Twinkle opens her luggage and finds a torn paper. She pastes the paper and sees a note from Yuvi which says Yuvi warning Twinkle not to leave Kunj as Anita is planning something. Twinkle takes Chinki and the proofs to the police station and asks them to leave Yuvi. The inspector asks them to bail him out if they want. Kunj sees Twinkle’s dupatta and stares at it and Pallavi glares at him. 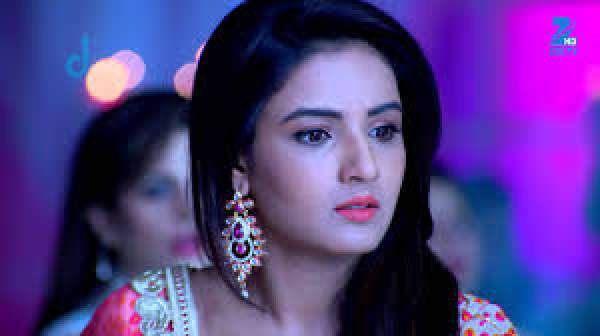 Yuvi is bailed out and Pallavi asks not to think of it as a favor and says Kunj will never allow an innocent to be punished. Twinkle comes home and tells it to the family. Usha slaps her and says she has lost her son and says now she also lost her daughter in law too. Usha says Yuvi killed my son and says she will not listen to her now. Leela too says she has done wrong by letting Yuvi out. Babbe too says the same and says she could have at least asked them before releasing Yuvi out. Yuvi sees everything from outside.